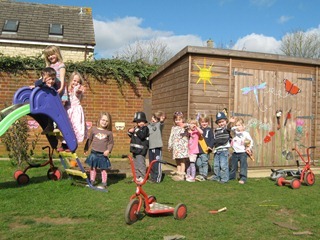 At Deddington Village Nursery we provide professional early years care and play-based education for children from their second birthday until the July after their third birthday. Deddington Partnership Foundation Stage Unit (PFSU) is our pre-school, providing care and early years education for children (aged 3 – 4), during the year before they start full-time education at primary school. Rated as ‘Good’ by Ofsted, we are open term-time, 8.30 am – 3.30 pm, Monday to Friday, with holiday clubs run during the Easter and summer holidays. The settings, run by qualified, experienced and dedicated staff, are run as not-for-profit, charities and operate under a voluntary committee structure (new members always welcome!). To find out if our nursery and pre-school are right for you and your child please come and visit us.